Everyday Life In The Time Of Jesus was filmed completely in the land of Israel , presented from the perspective of personal witnesses. Viewers are transported in time, as the camera angels cleverly managed to capture familiar vistas – The Sea of Galilee , the Judean hills, the Jordan Valley – without any trace of modern life. All in all, it is a worthwhile film for adults and children alike who want to understand Jesus' life and ministry in its authentic setting and at the same time enjoy original music without compromising the universal nature of His mission on Earth. 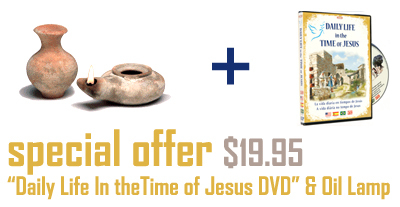 This Unique 90-minute Movie shows life as it was 2,000 years ago in the time of Jesus. Includes Original Soundtrack ‘Songs & Prayers from the old and new testament’. 1.THE LAND OF ISRAEL - To Everything There is a Season. 2. THE NEW YEAR & FARMING - Be Glad, O People of Zion , Rejoice in the Lord your God. 20. PESACH, THE FESTIVAL OF FREEDOM - Let My People Go! 30. RESURRECTION - I Am With You Always, Even to the End Of Days. Witness the Glory of God's Promised Land, Experience the World of our Lord. This Holy Land Oil Lamp and Jug set is a full-size, authentic replica of the most common household utensils used during the Second Temple period, the time when Jesus lived and preached. Formed from the very earth of the Holy Land, this oil lamp and jug set brings the light of Jesus' life directly into your home. Like their biblical originals, these fully-functional, reproduction terra-cotta lamps come unglazed and can be used with any common cooking oil. Olive oil, the choice oil of the ancient people of the Holy Land, produces an especially beautiful golden glow. Written By Jim Schutz,The Jerusalem Post. He was born into the most brutal of times. His body suffered the cruelest of deaths But then I witnessed His spirit transcend all. worldly pain and grow to encompass the Earth. He brought a message of peace and love to the whole world…a message from the King of heaven. And now I live just to share it with others. Accompanied by a scene of a Roman soldier brutally whipping a bloody Jesus on His way to be crucified, so begins Daily Life in the Time of Jesus , Doko Media's newest documentary about the historical Jesus in His own land and culture. Presented primarily from the point of view of an anonymous disciple (narrated in the rich baritone of singer Jonathan Settel), the film invites the viewer into the “everyday life and the times of the Jesus” as it follows Him through significant life events in the context of first-century Judean society. The result is a masterful demonstration of how Jesus' development and teaching were so intertwined with growing up in a Jewish family in the small farming village of Nazareth The close-knit community is faithfully portrayed living out the Biblical feasts. Each feast is presented in relation to an aspect of Jesus' life, but also in the context of the agricultural cycles. The viewed sees how olives were harvested and pressed into Succot and grapes are turned into vine at Passover . Moreover, the film depicts how Jesus would have learned valuable lessons working with His father, spending time in the fields with sheep and Shepherds, enjoying family meals and celebrating the Sabbath. Because the film is presented from the perspective of personal witnesses, it does not come across a dry historical documentary. Adding to the living atmosphere is a rich musical accompaniment of original Hebrew and English songs by well-known composer Elisheva Shomron . The songs are sung by Elisheva herself, along with other artists from the land. Also, in addition to the primary personal witness narrated by Jonathan Settel. Everyday life in the time of jesus was filmed completely in the land of Israel , and contains vibrant landscapes and dramatic scenes that bring its message all the more to life. Viewers are transported in time, as the camera angels cleverly managed to capture familiar vistas – The Sea of Galilee , the Judean hills, the Jordan Valley – without any trace of modern life. All in all, it is a worthwhile film for adults and children alike who want to understand Jesus' life and ministry in its authentic setting and at the same time enjoy original music without compromising the universal nature of His mission on Earth.